Upon purchasing a ticket, you are handed a plastic, pale green wristband, the color worn slightly from incessant heat and humidity. It resembles a watch without dials, housing instead an electronic mechanism that acts as a key to one of the hundreds of lockers on the lower levels of the building. For first time visitors, it can be tricky to figure out how it works. First you swipe to get in. Then, once you choose an available locker, you press the lock with the back of the wristband, and a red light flashes, signaling that it is locked. Pressing once again, a green light flashes and now the locker is unlocked. And if you ever forget which locker is yours, you can press the wristband against one of several small screens in the corridors, which will then promptly flash your locker number. An impressively useful, simple design. Once everything is securely locked away, the wristband’s work is done, and all that is left is to head up the stairs, walk outside and soak. The building, although quite plain and unimpressive from the outside, adorns a beautiful architecture on the walls that encompass the huge inner courtyard. 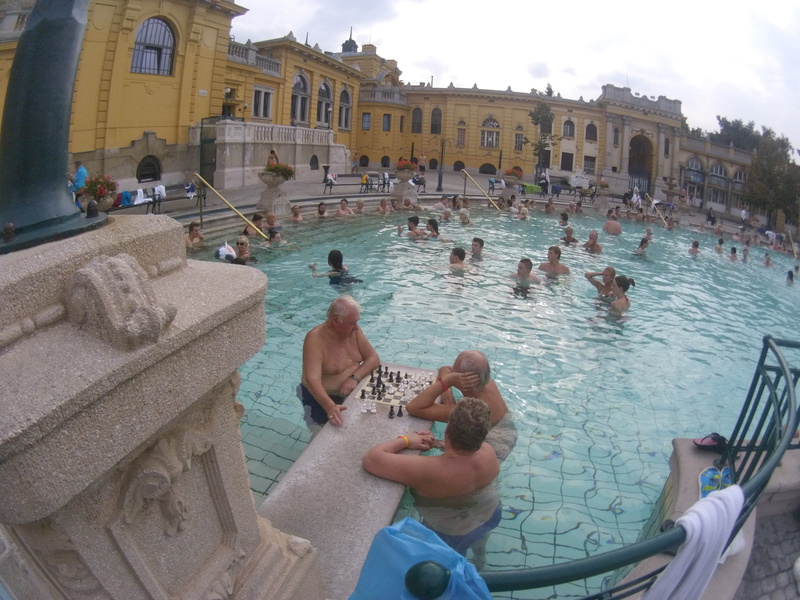 However, the first things to catch the eye are the thick clouds of steam that rise throughout the open courtyard, hovering over large outdoor pools filled to the brim with older Hungarians and younger tourists. 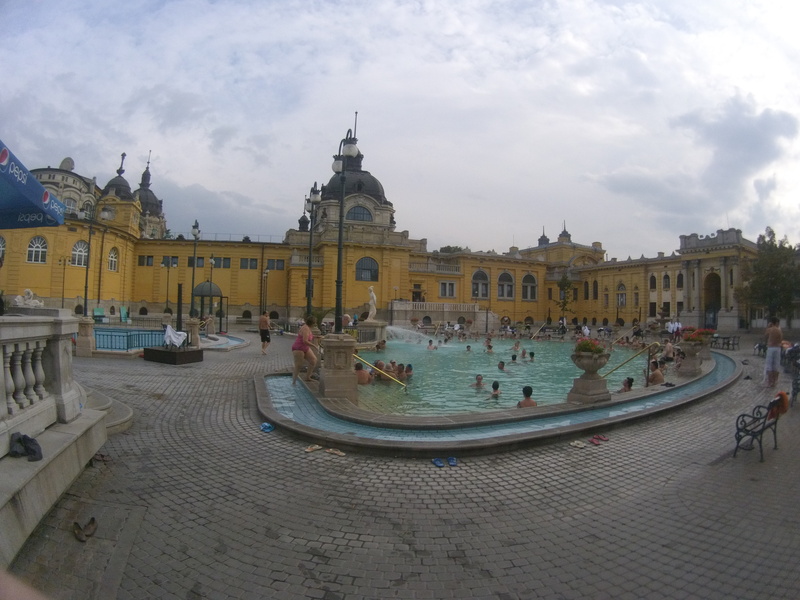 Welcome to Széchenyi Baths. 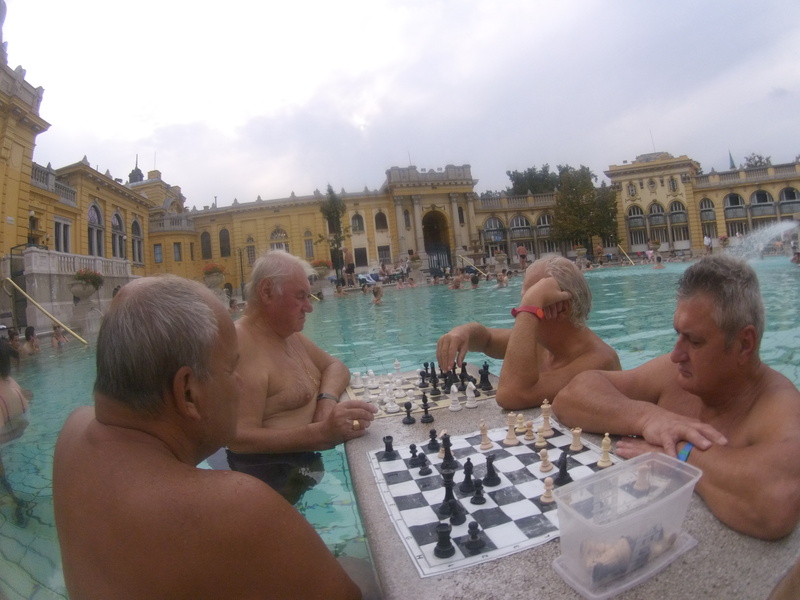 The meeting point of great minds, both entrances to the main outdoor pool are dominated by old Hungarian men, quietly engaged as they meticulously move the molding plastic pieces along the flattened paper boards. Many gather around to watch the brilliant games of chess, whether they speedily evolve in memorized, mechanic openings or drag on in heated, gridlock endgames. Every now and then, one of the players starts yelling in Hungarian, impatient with their opponent or savoring an inevitable triumph. A shout of “No Photo!” bursts out of the more vigilant players at camera-bearing observers. For such a relaxed atmosphere, there is a surprising level of intensity concentrated around these staircases. After watching patiently from the edges of the crowd over the course of a few games, I managed to work my way up to the sidelines. Obviously, I hoped to get in on at least one game, but from the looks of it, none of the players seemed to have the intention of leaving anytime soon. Every now and then, someone would meander over and ask in a thick Australian or British accent whether they could have next game, only to be bombarded by crude, dismisive grunts of “No English!” These guys weren’t messing around. After about an hour and a half of watching the same two guys, and a brief anglo-hungarian discussion of a specific position in the game, the older man to my right turned and motioned for me to fill his opponent’s spot…it seemed I had waited long enough and earned the privelege of playing. István, the owner of the board and my first opponent, had been playing at that very same spot for the past 60 years. He and his wife split a yearly pass with their neighbors, alternating each day and averaging about 175 visits per year. Needless to say, he quickly and mercilessly defeated me the first game, but I regained some self respect by drawing the second. After learning that I was Turkish, Istvan excitedly talked about his 1978 trip to Istanbul, and kept repeating the phrase “Cebimde bir elma var,” or “There is one apple in my pocket,” words that are apparantly identical in both of our languages. The games continued for about 3 hours, during which we constantly rotated players and I managed to squeeze in a few wins. But the 36 degree water and a very empty stomach were beginning to make me lightheaded, so I bid István and the others farewell. Having already spent about 12 days in Budapest, this seemingly bizarre experience of playing chess in a spa felt quite normal. 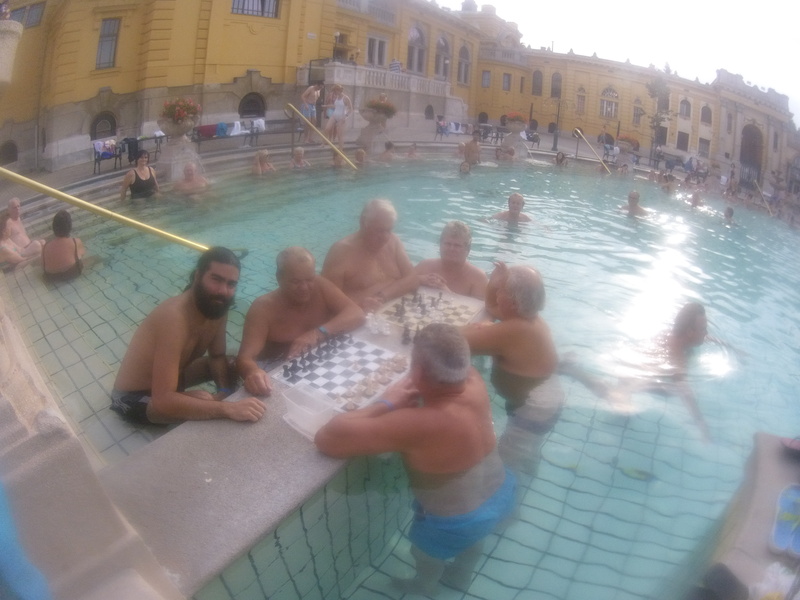 For such a funky and unique city, thermal spa chess was just another element of its charm and allure. And like all aspects of the city, what initially seems foreign, intriguing and a little rough on the surface quickly becomes welcoming and captivating. One is quickly drawn in, not quite sure where or how they fit into the whole picture, but somehow it works. All it takes is jumping in and surrendering oneself to the eccentric rhythym. And once that rhythym begins to feel natural, it becomes very difficult to stop moving to it.